A solid pink tongue is a disqualifying fault. 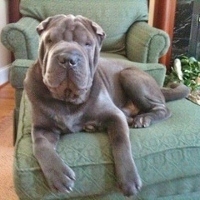 It means that a Shar-Pei cannot be shown and they should not be bred. Shar-Pei are supposed to have a solid pigmented tongue that ranges in color from a pale lavendar to a blue-black tongue. Usually the darker the coat color the darker the tongue color will be. A cream dilute, for example, should have a light lavendar mouth and tongue color.